The fixed station monthly monitoring program consists of sites that have been sampled monthly or twice monthly since 1985. Sites are visited by our Research Vessel Kerhin and smaller boats, or accessed via road/ferry crossings. Water quality profiles are taken, as well as nutrient, sediment and chlorophyll samples. 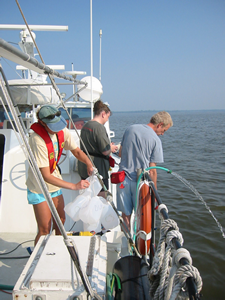 Virginia follows identical sampling protocols and full data results are available via the EPA Chesapeake Bay Program Data Hub. These data are the backbone of the Chesapeake and Coastal Bays management and restoration efforts. They are instrumental in determining the long-term trends and current status of water quality in the region. The data underlie products such as water quality report cards and barometers, as well as models that help to refine watershed management efforts. Fixed station, monthly monitoring data is currently available for 89 stations. Charts for water temperature, salinity, pH, secchi depth (water clarity), and bottom dissolved oxygen depict the long-term monthly minimum, maximum and average results versus current monthly conditions. Click here to view a downloadable table of Long Term Fixed Stations, with site coordinates. View/download table of Fixed Station Information Description: This station is a mid-channel site located at the head of the Chesapeake Bay, near the mouth of the Susquehanna River. This station is located in the tidal fresh zone (salinity 0 to 0.5 ppt) in approximately 6 meters of water. NOTE: 'Not Sampled' can mean either the station was logistially unable to be sampled, or the data are still in the collection and processing phase. Results displayed are provisional and have not undergone full Quality Assurance procedures, and as such we cannot guarantee their accuracy at this time.